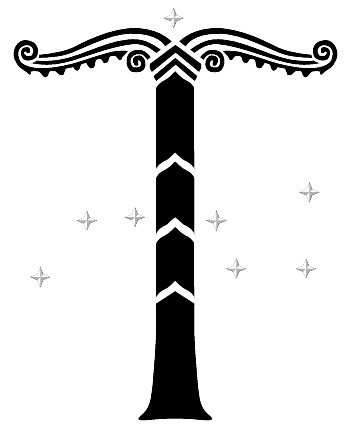 Over the years, beside the Thor’s Hammer or the Valknut, the Irminsul has become one of the most important symbols among the northern tradition groups and followers. And, in some places – particularly in continental Europa, it has largely replaced the Thor Hammer itself. This evolution may be more than an aesthetic choice: in a way, we can say that the symbol of life and stability, the Irminsul, is beginning to replace the symbol of fight, the war hammer. Does that mean that the northern Tradition has arrived to a kind of maturity and that we do not have to fight as much as before? But precisely what is the Irminsul? In 772, at the beginning of his bloody crusade against the Saxons, it is known that the emperor Charlemagne (Karl der Grösse) destroyed a gigantic pillar or column. It stood up on the top of a high natural and living stone block or pillar complex, the Externsteine, located in the south edge of the Teutoberger forest, not far from the place were the Cherusci leader ARMINIUS (or Hermann) destroyed the three best Roman legions in 9 CE. So, the Extersteine and the Irminsul are in the heart of the big Thuringian megalithic area. This sacred pillar was the symbol of the Saxon people. This is why Charlemagne wanted to destroy it first – by doing such would symbolise the destruction of the soul of the Saxons. Thus, this sacred pillar overhung the big sanctuary of the Externsteine, which stands very close to the city of Horn (the name is important because of the shape of the Irminsul – which has what appear to be horns). The Externsteine stands as the beacon of the heathen world, the most holy stead, certainly, of the Northern Tradition yesterday and today, but also one of the most important religious and cultural centres of the archaic Europa. We would have a lot of elements to develop concerning the Externsteine and the sacred pillar. I shall only concentrate on specific points. One called this destroyed pillar Irminsul. Generally it is said that this word means “column of Irmin “, after the name of a mysterious Germanic God. But some propose to translate it by “gigantic column”, without any link with a God IRMIN. It would be quite difficult to speak briefly here of IRMIN. Just let me tell you two or three small points. Many specialists have discussed the reality of this God’s existence. It seems certain that there was a God called IRMIN in the Saxon Hof (I use Hof with a capital, in place of the Greek Pantheon). Again maybe, this name only means GREAT GOD. As far as we can observe him, he can be identified with Tyr/Tiwaz – see the form of the Tiwaz rune, which could be a link between Irminsul and TYR – or identified with Heimdal. In former texts, I have given my preference to this latter solution. Heimdal has been identified with Yggdrasil and Jörmungand. It is a very long demonstration. Professor Régis Boyer, in France, one of the most important specialists of the Old Norse religion, has written a book to explain this identification. Just to understand, I give you here some tracks to follow to understand this identification between Yggdrasil and Heimdal. We know the links between men and trees in the north. The first man and woman were created from trees. Yggdrasil is the sacred tree and Heimdal the god of men, of the human society when he creates the three functions. The Yggdrasil tree is the link between the world, a bridge, like the Bifrost rainbow. However, Heimdal is the warder of the bridge. And this god lives in Himinbjörg, the sky mountain, in which we can easily recognize a central concept, similar to the Ur-Welt, the original land, or the world tree. The real meaning of this name – Heimdal – is mysterious, but it is sure that it conveys an idea of pillar. This Heimdal – for a lot of reasons – is bound to some ideas of universal origin and support. Furthermore, in a stirring idea of polarity, some identify Heimdal, Yggdrasil and Jörmungand, the world serpent. It is said that Heimdal’s head is an Iron Sword, which could evoke the head of a snake. The name Jörmungand means GREAT GAND or WAND, which could describe Yggdrasil. The nine sisters – the nine Mothers of Heimdal’s – could evoke the nine worlds and these sisters are described as nine waves, which bring us back to the sea where Jörmungand lives. Jörmungand is like the Greek and alchemical snake Ouroboros which bites its own tail. It is a threat for the world, but it is the world and its support itself. When Yggdrasil will collapse, when Midgardsomr – Jörmungand – will uncoil itself, when Heimdal will be overcome by Loki, it will be the end of the world, say the old texts. One would need books to explain this polar symbolism, but it works. And so, to come back to IRMIN, I prefer the identification between IRMIN with Heimdal, rather than Tyr. In the Germanic countries, columns were often raised on geomantic or symbolic places (crossroads, city centres). In England, they are often called perrons, market cross or butter cross or staple. But in Germany, these columns were called IRMINSÄULE (Irminsul) or Roland Saüle. It is an allusion to Roland, the Carolingian hero of Roncevaux battle, the friend of Charlemagne. In fact, behind Roland, we must see the archetypal representation of a Horn bearer or a Horn blower (anyway, it would have been – and it is – strange and paradoxical to take the name of a Carolingian hero, as the Carolingians destroyed the Irminsul). Roland is famous for his horn. And do not forget that the Horn blower god is Heimdal (and, under his IRMIN name, he gave is old names to the columns, which from Irminsaülen became Rolandsaülen). Well, in fact, the Belgian count and famous esoterist and symbolist Goblet d’Alviella said that the name of similar columns were Tiodute, that is “pillar of Tyr”. Thus, we could again go very far in our explanations. But we must stop here, to come back to our Irminsul. The Irminsul represented Yggdrasil, the cosmic axis. Rudolf von Fulda, a Christian missionary, spoke of an universal columns quasi sustinens omnia (universal column, supporting almost anything). Adam of Brema described Yggdrasil and the sacred tree of Uppsala in similar terms. The wonderful stead of the Externsteine has been patterned by nature as a sanctuary. It is constituted of seven main rock sandstone blocks (30 meters high) overhanging a small lake. There’s a big crowd gathered there for the summer solstice. We can still see the squared base where the Irminsul stood at the top of the main block. Just under the top of this main block, we have an open-air sanctuary (but we can see traces of roof, probably destroyed by Charlemagne’s men). A hole is pierced in the eastern wall. On the summer solstice dawn, the sun goes through this hole and come to touch the opposite wall. On the wall, the sun creates suddenly the shape of a dagger, then a sword and finally a spear. Just near, we have a representation of the one-eyed Odin. It is very curious that the Christians have let this sanctuary and Odin’s head. But at the bottom of the rock 1, at the entrance of a cave, we have also the very old statue of a key-bearer character. It is named today Saint Peter. In fact, it has exactly the shape of the Roman two-faced God Janus, warder of the doors (and especially the year doors, the solstices), which we call Jolnir (that is Odin himself, god of the Yule tide). But concerning the Extersteine, it is astonishing to note that the real shape of the Irminsul has been saved from oblivion by the Christians themselves. Another Odinic paradox ! To celebrate their “high deed”, they put at the bottom of the Cliff 1, a carving which shows the Irminsul overcome, therefore we have the real shape of the old pillar. It seems that the holy stead of the Externsteine has been used during at least four thousands years. Since the prehistory, it would have been used, as an astronomical observatory. All the configuration – and curiously the natural configuration – proves that it marks the movement of the stars, of the eclipses, and the dates of the solstice. Generally, we ignore that, close to the Externsteine (4 km far from the stead), there is another holy stead seemingly dedicated to the moon, Oesterholz (see the name of the old spring goddess, Ostara/Eostre). It would have been the lunar counterpart of the solar Externsteine. 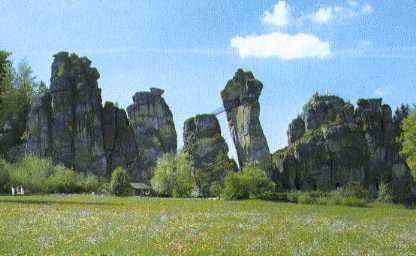 Probably, the Irminsul of the Externsteine was particularly spectacular, but there were other similar columns recorded, for example in Eresburg, Heligoland or Fulda. Concerning this last one, we have a strange chronicle of the monk Widukind of Corvey. He said that this column had been set at the entrance of the conquered city of Fulda by the Saxons after a victory against the Thuringians. This column would have been dedicated to Mars, called here HIRMIN, and this name, according to the monk, would be a form of the Greek HERMES (which is nonsense, even if Hermes-Mercure is also Odin-Wodan). According to the German author and symbolist, Walter Blachetta, the shape of the Irminsul recalls the Horns of an Aries. It links this shape with the cross and the Thor’ s hammer. In this way, this classical theory would demonstrate that the Irminsul is a male symbol. But Blachetta says that the Irminsul, image of achievement and wholeness, embodies the masculine symbol (Aries Horns) and the feminine one (cradle). This symbolism would show that any life bears in itself the becoming and the end. And we must not forget that the shape of the Irminsul recalls the genitalia of woman (besides, we can say that the Anglo-Saxon rune Ear recalls too the Irminsul and means “grave”, thus the end.). It symbolizes the end of the journey on Yggdrasil. But this end may also be the end of the initiation, the total achievement. But, first we could also associate the shape of the Irminsul to the shape of a tree (see ehwaz, symbol of life). We can consider that the archetypal expression of centrality, of vertebrality, which is the world tree of the Northern Tradition has never find a more wonderful representation other than the Irminsul. And despite its destruction, it has survived with the same symbolism of centrality and bridge between the worlds and the humans and gods. Who bore this function of bridge? The king. And the Irminsul modified its shape to become the royal Fleur de Lis which can be found on the Sceptre. We could also talk of the Irminsul or Irminsaüle as time-markers or column of sacrifice (the sacrifice which is the Blot, the rite, that means literally the ordering of the world, the wheel of destiny). The symbolic image of the tree has been perpetuated by the Christians. When they destroyed the sacred trees, they introduced at the same time the cross. But the first crosses in Germany had the forms of the Ehwaz rune, the Yew rune, the tree of life. Finally, Yggdrasil and the Irminsul, both symbols of centrality and stability, are representations of the cosmic axis which pass through the world and in each worlds. The precise place of passage of the axis is called Thula. In the sky, it is the North star, the Polar star. Around it turn the great and the little Bears as the branches of the Fylfot or Svastika (an old solar concept). Often the Irminsul is represented with the great or the little bears and the polar star above. And the Extersteine with its 7 blocks represents all the body – the human body and the multiversal body – with its 7 hvels/chakras, its 7 power centres, when the Irminsul, image of the cosmic axis, stood for the spine. We can recall here that the word Thula (there were a famous society in Germany at the beginning of the century called the Thulé Gesellschaft. It came from another organisation, the Order of Germans, which had the Irminsul with the Great Bears, as symbol) comes from the Sanskrit Tula, which mean Balance and this is another name for the great Bear. And the last point: see a balance, the scales. It reminds also the shape of the Irminsul. The idea and localization of the original and spiritual centre, the centre of the world. The initiatic side through its dimension of bridges between the world. Die Irminsul der Artgemeinschaft e.V. Please see www.nordzeit.de/irmi.htm for a German-language article about the Irminsul.